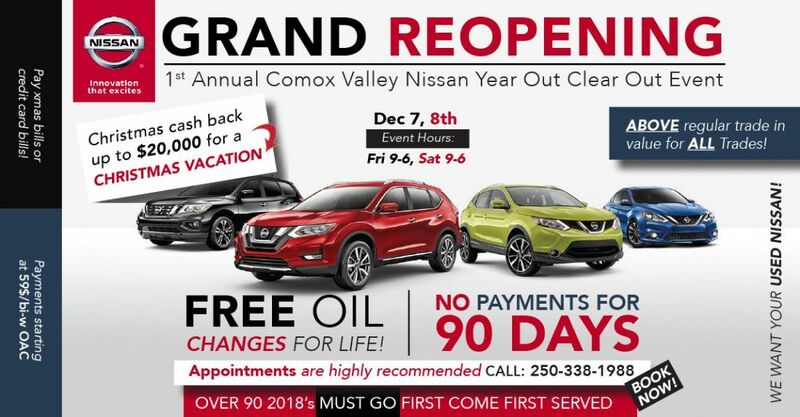 Comox Valley Nissan is under new ownership and the Landsperg Automotive Group wants to welcome you!!! During our 2 day event we are offering exceptional deals on all remaining 2018’s and we are even offering Christmas Cash Back. To show we care we want you to have peace of mind through out the ownership of your vehicle, so we are throwing in FREE Oil Changes for Life on any new vehicle purchase. If you want to take advantage of these special offers book an appointment below. If you want to just come by and have some lunch on Saturday and meet all the new faces, come on by we would love to see you!